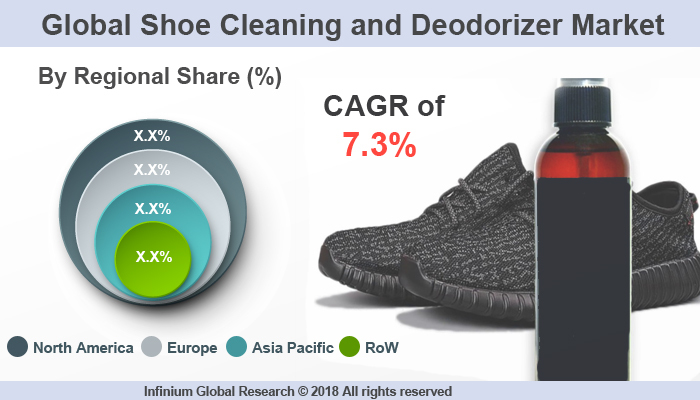 A recent report published by Infinium Global Research on shoe cleaning and deodorizer market provides in depth analysis of segments and sub-segments in global as well as regional shoe cleaning and deodorizer market. The study also highlights the impact of drivers, restraints and macro indicators on the global and regional shoe cleaning and deodorizer market over the short term as well as long term. The report is a comprehensive presentation of trends, forecast and dollar values of global shoe cleaning and deodorizer market. According to report the global shoe cleaning and deodorizer market is projected to grow at a CAGR of 7.3% over the forecast period of 2018-2024. Shoe care includes those products that are used to enhance the life of the shoes. Additionally, it helps to make shoe attractive for a longer time. Shoe care includes a large number of products such as cream, polish, spray, brushes. Additionally, it includes shoe cleaning and deodorizers, that helps to remove the foul smell and provide a good look for the shoe. Shoe care products are used for various applications such as formal shoes, casual shoes, sports shoes, and others. The key driving factors of the global shoe care market are the growth in e-shoe shopping sites, growing number of young workforce entering in corporate jobs, desire to look smart and growing disposable income among young consumers. Additionally, the growing demand for sports footwear owing to growing health concerns among consumers, and growing fashion awareness among consumers across the globe are helping to boost the market. Further, customization of shoes for several different requirements such as sport, walking, and physical training, formal shoe etc. are helping to differentiate the requirement of different shoe care products to enhance their life. Other key factors that are driving the global shoe care market are a significant rise in Innovation/R&D pace and growing importance of orthopedic shoes. The key trends such as a high focus on marketing strategies by key manufacturers, innovation in shoe products along with growing demand for leather shoes among consumers are helping to grow the market in the medium and long-term. The key restraining factors of the global shoe care market are rapidly changing consumer preferences, increasing use of low maintenance are hindering the growth of the market in the medium term. Growing importance of physical fitness and the influence of corporate culture is expected to fuel the growth of show care market. Additionally, increasing disposable income among young and middle-class consumers are expected to boost the market for the long term. The North America market is estimated to dominate the shoe care market followed by the European region. Among the emerging markets, APAC is estimated to exhibit a highest CAGR growth rate, due to growing demand of different varieties of the shoe and its shoe care products during the forecasted period. Latin America is expected to follow Asia Pacific market, improving economic conditions, growing disposable income and increasing demand for sports shoes is anticipated to be the key factors driving growth in this region. The report on global shoe cleaning and deodorizer market covers segments such as, product and end user. On the basis of product the global shoe cleaning and deodorizer market is categorized into powders, sprays, insoles, balls and ultraviolet (UV). On the basis of end user the global shoe cleaning and deodorizer market is categorized into athletes and non-athletes. The report provides profiles of the companies in the global shoe cleaning and deodorizer market such as, S.C. Johnson & Son, Inc., Reckitt Benckiser Group plc. (U.S.), Shenzhen Chunwang Environmental Protection Technology Co. Ltd. (China), Guangzhou Bubujie Household Products Co. Ltd. (China), Zoshin Co. Ltd. (Japan), Rocket Pure (U.S.), Chattem, Inc. (U.S.), Blistex Inc. (U.S.), Merck & Co., Inc. (U.S.) and StinkBOSS (U.S.). The report provides deep insights on demand forecasts, market trends and micro and macro indicators. In addition, this report provides insights on the factors that are driving and restraining the global shoe cleaning and deodorizer market. Moreover, IGR-Growth Matrix analysis given in the report brings an insight on the investment areas that existing or new market players can consider. The report provides insights into the market using analytical tools such as Porter's five forces analysis and DRO analysis of shoe cleaning and deodorizer market. Moreover, the study highlights current market trends and provides forecast from 2018-2024. We also have highlighted future trends in the shoe cleaning and deodorizer market that will impact the demand during the forecast period. Moreover, the competitive analysis given in each regional market brings an insight on the market share of the leading players. This report will help manufacturers, suppliers and distributors of the shoe cleaning and deodorizer market to understand the present and future trends in this market and formulate their strategies accordingly.